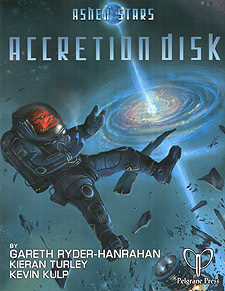 An Accretion Disk form around massive bodies in space. Gravity drags in random objects and debris, spinning them around and bringing them in closer and closer, faster and faster, hotter and hotter, until something explodes. It holds true for stars and black holes - and for politics and crime, too. And let's face it - you're the ones who are going to be standing in the path of that explosive release. Better get ready. Sample clues, special spend benefits, and added data on each Investigative ability. Learn how to use Kinetics to escape VR simulations, identify alien interference in pre-contact cultures, and trace viro-augmented criminals with endocrinological profiling. More options and tactics for general abilities, including species-specific ones. Master zero-g martial arts, detect weapons as they charge up, and acquire corporate sponsorship for your Laser team to boost your cash flow! Take your stations on board ship with options and tactics for each warpside and groundside role, then delve into player-drive Arcs and Drives. Guide your own destiny amid the guttering Ashen Stars. Explore new character options with six new playable races. Deckplans for every class of ship show you what it's like on board - and new ship options and bolt-ons open up tactics for shipboard adventures. When you hit dirtside, break out any of the dozens of new weapons, equipment items, cyberware or viroware - if you can afford the upkeep! Hot Contracts give a roster of jobs that only a Laser crew can handle. Pick your own challenge hot off the Bleed, and get to work!